Culms: Erect to ascending, stout, hollow, glabrous to hairy just below nodes. Blades: Flat, narrow, 1 to 8 inches long, to 1/4 inch wide, glabrous or sparsely hairy. Sheaths: Closed to near top; lower sheaths spreading-hairy; upper sheaths often glabrous. Ligules: Membranous, to 1/5 inch long, whitish; auricles absent. Inflorescences: Panicle, flat, usually contracted, 2 to 10 inches long, greenish, turning straw colored when mature; branches erect or drooping. Spikelets: Strongly flattened, 4-12-flowered, .8 to 1.4 inches long, 1/6 to 1/2 inch wide, green, sometimes purple tinged, glabrous; glumes narrow, unequal, 1/3 to 1/2 inch long, smooth or slightly rough, awnless or with awn less than 1/12 inch long; first glume 5-9-nerved; second glume 7-11-nerved; lemmas overlapping, sharply keeled, broadly lanceolate, tips pointed, awnless or short-awned. Habitat: Pastures, prairies, fields, roadsides, waste areas, protected bottomlands, and ditches. Distribution: South 1/2 of Kansas. Origin: Native of Argentina and Uruguay. Introduced in the south of the U.S. as a pasture plant. Now naturalized. Forage Value: Very palatable. Will provide moderately good grazing for cattle but only fair for wildlife. Close grazing will damage the plant. Uses: Provides seeds for birds and small mammals. The Kiowa recognized rescue grass as an important fodder. Comments: Cool season tufted bunchgrass. Growth begins in late fall and continues through the winter. The plants mature in the spring. 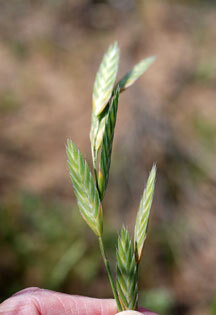 It is named "rescue grass" because it provides forage following drought conditions or severe winters.